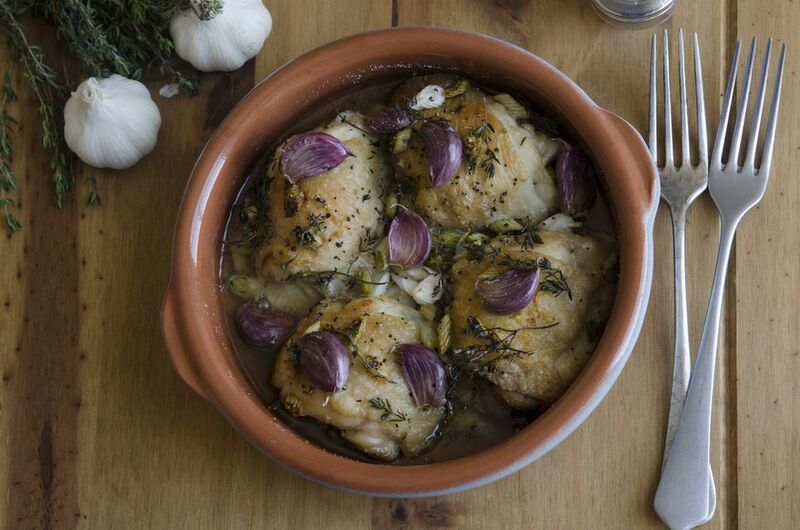 Garlic chicken, or pollo al ajillo, is a classic Spanish recipe. Even though it hails from the Andalusian region, it is enjoyed all over Spain. This version is cooked on the stove rather than roasted in the oven. As the name suggests, garlic is the main player in this recipe. It is combined with white wine to make the base for the sauce. Like all popular and classic recipes in Spanish cuisine, every family has their own version. Some cooks include a hot pepper, paprika, and vinegar—as this recipe does—to add a bit of spice as well as a tangy bite. While the recipe calls for a whole chicken and cutting it up yourself, you can always purchase pre-cut chicken to save time and make it even easier. Marinating the chicken for an hour or two before browning it assures a moist result, so it's best not to skip that step. Cut chicken into 10 to 12 pieces. Rinse and pat dry. Place the chicken in a large glass dish and squeeze lemon juice over it. Peel 2 garlic cloves and chop finely. Rub the garlic, salt, and pepper into the chicken. Marinate for 1 to 2 hours. In a large, heavy-bottomed frying pan, pour 3/4 cup of the olive oil and heat over medium heat. Remove the chicken from the marinade and drain well. Place the chicken in the hot oil and brown on both sides. Remove the chicken from the frying pan and place in a Dutch oven or a covered, deep frying pan. Add the white wine and bay leaf. Cover and simmer on low until the wine is reduced. While the chicken simmers, peel and cut the potatoes into thin round slices or small cubes. In a small frying pan, heat the remaining 3/4 cup olive oil on medium high and fry the potatoes. Remove potatoes and add them to the chicken. If more sauce is desired, add the cup of broth now. Reduce the heat to low and continue to simmer, covered. Finely chop the parsley and sprinkle over chicken. Peel the remaining 4 cloves of garlic and cut into thin slices. In the same pan used to brown the chicken, lightly sauté the garlic, and add the hot pepper, if using. Add Spanish paprika, vinegar, and sugar. Stir, scraping the bottom of the pan. Pour over the chicken. Adjust the seasoning to taste, and serve.